Once, in my fiction writing days, I contemplated a story about a character who became famous, after which he would no longer be seen with the third-person omniscient voice. From then on, the reader would only experience him in the third person, and only through a media filter. It would be as if he went into another realm. I suppose that’s how I see the famous: in another realm. 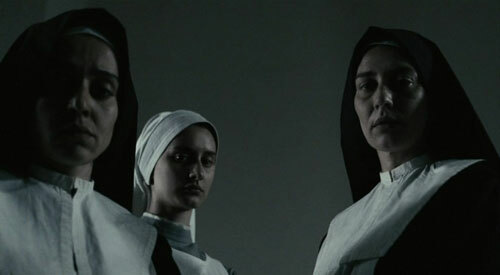 “Vincere,” written and directed by Marco Bellocchio, does something similar but better. The first half of the movie focuses on the torrid romance between Ida Dalser (Giovanna Mezzogiorno) and a young, Socialist journalist, Benito Mussolini (Filippo Timi), in Milano in the 1910s. They get married, have a child. Then she discovers he’s already married. As he accrues power, she is shunted to the side. Once he becomes prime minister, he disappears from the story. 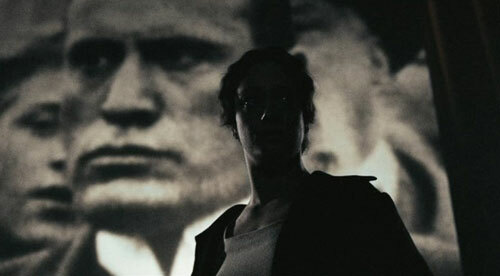 We only experience him through a media filter: in newsreel footage and newspaper photos. It’s as if he disappeared into another realm. Here’s the “better.” Ida is eventually put into an insane asylum, where she keeps insisting she’s the wife of Benito Mussolini. Initially, since it’s her story we’re watching, we think this is a gross injustice. But at some point we wonder: Wait a minute. Did the first half of the film, that fevered dream, happen? Or did it only happen in her mind? 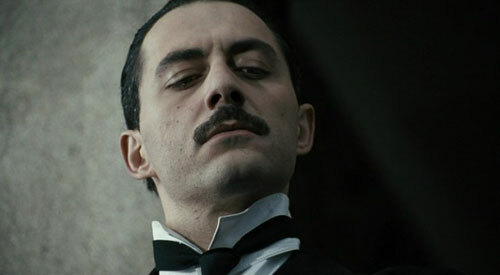 That Mussolini is played by Timi as a young man and himself in newsreel footage furthers our doubt. This doubt, I’m willing to concede, could be reserved for people, like myself, unfamiliar with her story. Or his. That surprised me. I don’t know much about Mussolini, do I? I just know the bald, strutting clown on the balcony, head tilted up, bottom lip pouted, arms akimbo. But that he was once a journalist? And a socialist? And had hair? This jumping around from place to place, from year to year, adds to the sense of a fevered dream. How do they hook up again? He always seems there. His voice is thunderous during protests but in private he hardly speaks to her. Is she there? Is he? And why so many scenes in movie theaters? While watching newsreel footage of the beginnings of the Great War, he cries out “Viva Italia!” and helps cause a riot that mirrors the violence on screen. In the hospital, wounded, he watches Giulio Antamoro’s “Cristus” and probably gets ideas—as if he needed them. She sees ... is it a jungle movie? ... and the kids in the audience act the apes. Life is mirrored on the screen. Then life becomes the screen. Suddenly he’s prime minister, and at the theater Ida’s view is blocked by all the young Fascists standing and saluting his image, huge now, and one-dimensional. She has to share him with everyone. ... his huge, flickering, one-dimensional image. Attempting to meet Mussolini’s functionary in Trento (she’s reduced to that), she’s beaten by black shirts and interred in a mental hospital in Pergine. She fits right in. 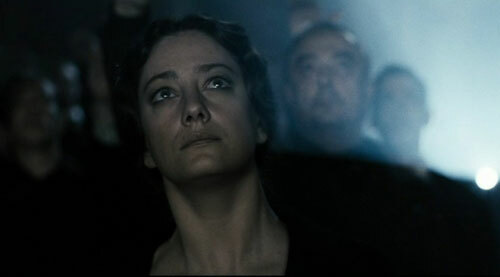 “I’m Mussolini’s wife!” she cries. “And I’m Napoleon’s!” another woman answers. Then the stakes become known. “My son is waiting,” she says. Everyone just stares. Oops. There is no figure more sympathetic than a mother kept from her child, but initially Ida doesn’t have ours. In practical terms, she chooses her lover, who is one of the great criminals of the 20th century, over her son, who is an innocent. She turns totalitarian eyes toward him. 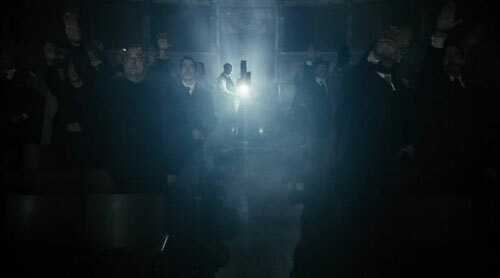 The secret police tear him from her sister’s family and place him in a private school, where he can be watched. It’s a heart-rending scene. “Uncle, help!” the boy shouts as the uncle is held back and the car speeds away. Maybe I found it heart-rending because I’m an uncle. She keeps trying. There’s a beautiful scene, a Christmas scene, where she climbs a fence and sails out letters to her son amid the swirl of snowfall. It’s a fruitless act but it feels like a necessary act. Her circumstances are specific but it seems a universal gesture. We are all trapped. We are all just trying to get word out. 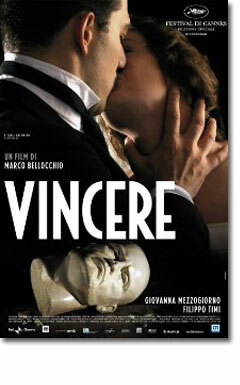 “Vincere” is beautifully filmed and powerfully acted but its story is uneven, its ending unsatisfying. 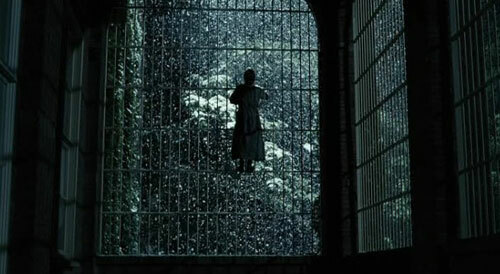 Did Bellocchio need to focus on the elements he focused on? Were there no better scenes? Were some cut? We get seven fewer minutes in the States than they got in Italy. What did we miss? That was my first reaction. But I find myself warming to its unknowability. It feels like it’s trying to communicate something important but I can’t fathom it. It feels like a letter sailed out into the night.